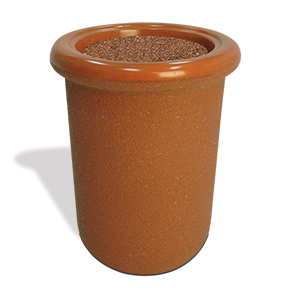 Attractive concrete ash urns are a great conscious reminder for smokers not to litter. This practical and elegant round outdoor ashtray provides a generous opening to dispose of any smoking butts. Sand urns function well for contain contents while ensuring the proper suffocation of any lit material. ASTM compliant rebar reinforced concrete is a stable, rugged and fire resistant material. This round concrete ash urn is available in a variety of standard and premium finishes to complement any exterior.